When it's hot out, my body craves lighter food. Eating seasonally, the kitchen pendulum swings [yeah, there's a pendulum swinging in my kitchen. that's why it's a mess all the time!] from hearty chili, stew, or casseroles over to simply seasoned piles of pretty vegetables. 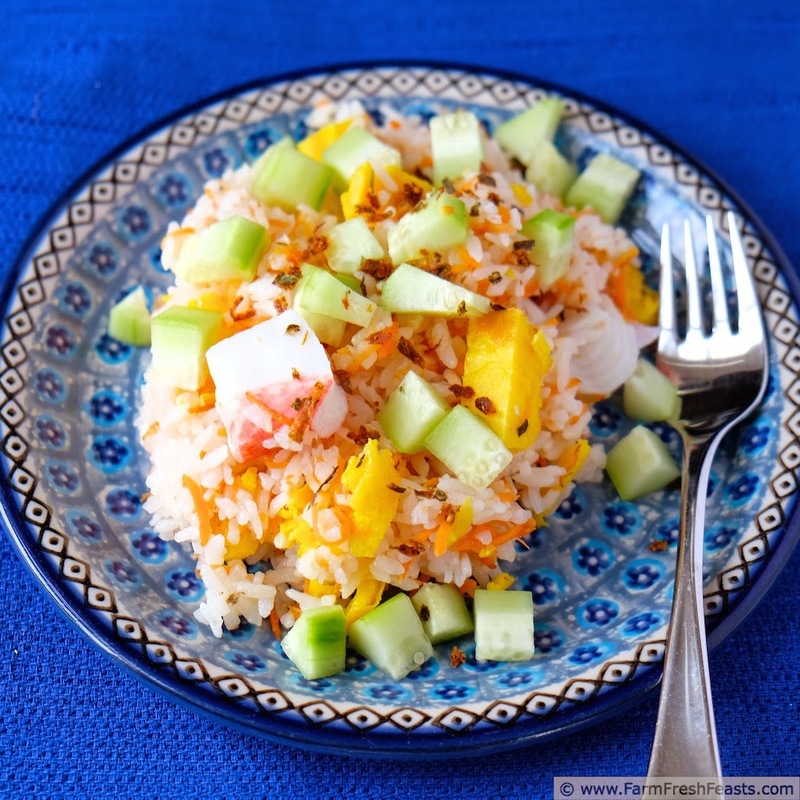 Making a chirashi sushi is one way to keep it cool in the hot weather. Chirashi sushi means scattered sushi, which means I get to be lazy all the flavors without all the fuss of rolling your own. I love to roll my own sushi, don't get me wrong. The other day I made a bunch of pretty, and tasty, Egg, Kohlrabi and Carrot rolls. Taking a page from Fusian we put panko over top and the flavor/texture contrast was really neat. This keeps for a couple of days and can be reheated gently in the microwave. I store the cucumbers/kohlrabi separate because I like them cool and crunchy. 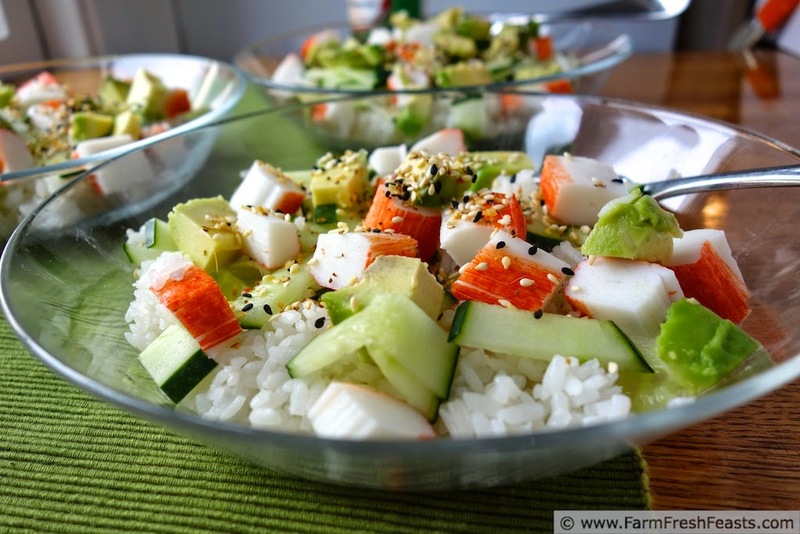 When I make chirashi sushi I generally see what vegetables I've got on hand--any combination of carrot, cucumber, kohlrabi, avocado all work well in this meal. 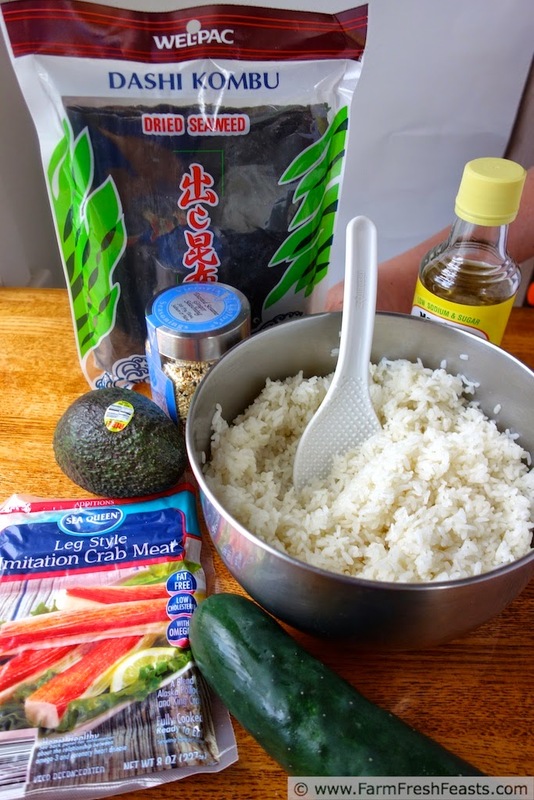 I was planning on making sushi when I assembled these ingredients--can you see why I changed the plan? Kombu does NOT substitute for Nori! In a small skillet cook eggs until set. I tend to pour a little egg mixture in at a time, then roll it up to one side and add more to cook, repeating until all the egg mixture is cooked. Remove to a cutting board and chop into cubes. 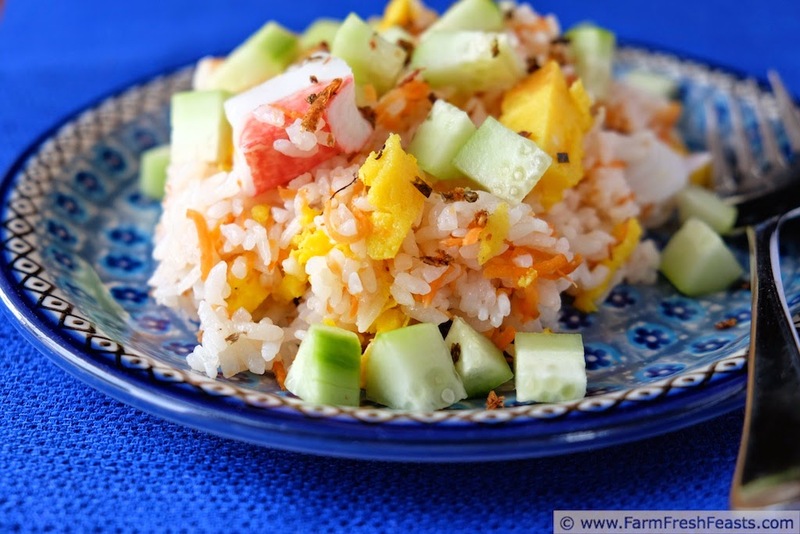 In a large bowl, toss cooked rice with seasoned rice vinegar until thoroughly mixed. 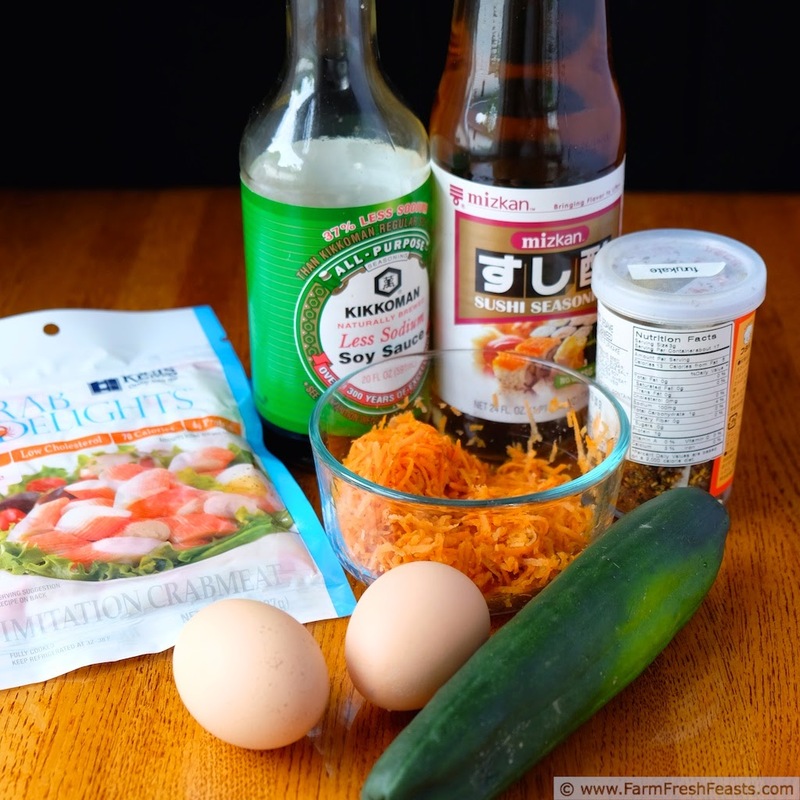 Add carrots, egg, and crab meat (if desired) and toss to combine. [I like to serve the green vegetables separately for folks to add to their plates, because we usually have leftovers of this and I don't want to reheat the cucumbers while I'm reheating the egg and rice]. Add optional seasonings and serve. Meghan, I need to get these kohlrabi sushi rolls up. They are tasty and use kohlrabi right up I also used it (with turnips and potato) in an enchilada filling. It's very versatile. This looks delicious Kirsten! 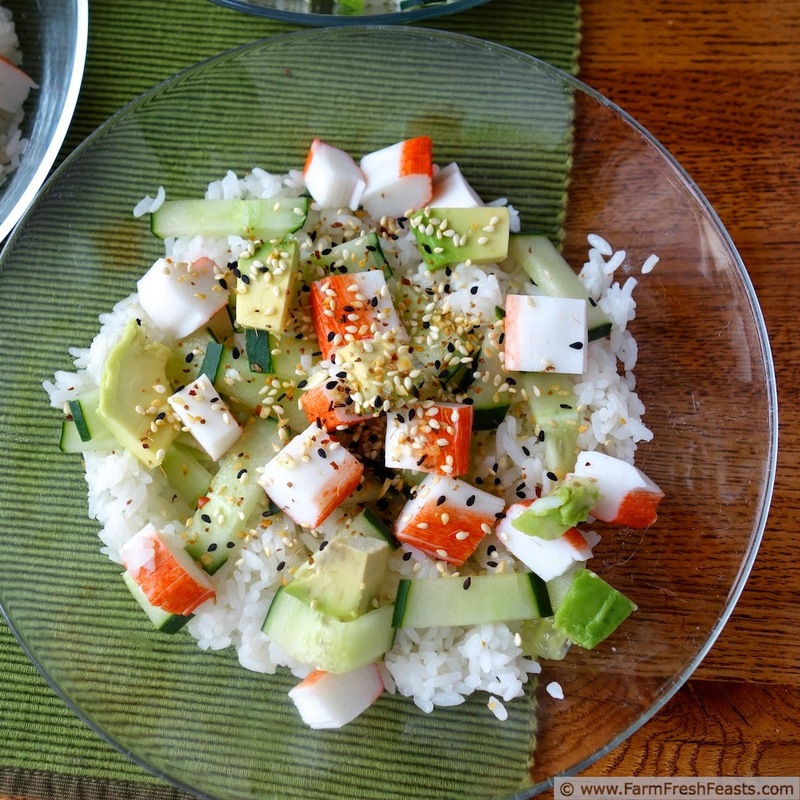 I just found and pinned a recipe for homemade furikake. 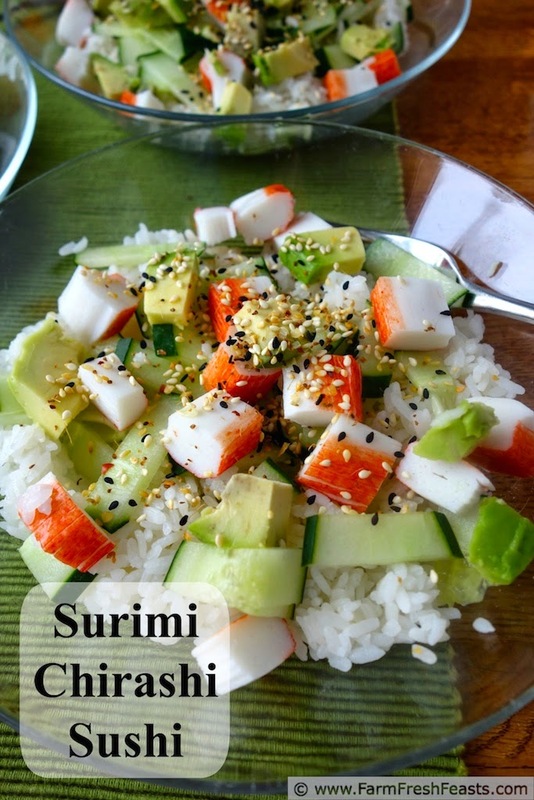 I will have to make some and try your Surimi Chirashi Sushi real soon. Pinning! Have a great day! Homemade furikake?! How cool is that! Boy I love how you can find anything on the internets.